Each nation has its’ own civil execution system which reflects its history and socio-economic system. On the other hand, in a certain degree, there are similarities in devices directed to the same purposes, including attachment and sales. Especially for developing countries, civil execution system is expected to change with the progress of internationalization of economy. 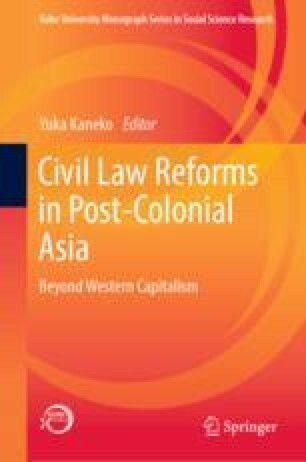 As the economic relationship between Japan and Myanmar is deepened through increasing investments, now is the time to try compare the civil execution systems both countries to consider the needs for legal reform movement which is already being sought between both governments. Yoshifumi Akanishi—Professor of Law, Kinki University, Japan; Former Presiding Justice at Osaka High Court; LL.B. Kyoto University; LL.M., Kyoto University. Mori Hamada & Matsumoto. (2013). 2012 nendo Myanmar Renpo Kyowakoku houseido chosa hohkokusyo (2012 Report on the legal system in the Republic of the Union of Myanmar). Ministry of Justice. http://www.moj.go.jp/content/000110245.pdf; http://www.moj.go.jp/content/000109989.pdf; http://www.moj.go.jp/content/000110246.pdf; http://www.moj.go.jp/content/000110247.pdf; http://www.moj.go.jp/content/000110248.pdf; http://www.moj.go.jp/content/000110249.pdf; http://www.moj.go.jp/content/000110250.pdf; http://www.moj.go.jp/content/000110252.pdf; http://www.moj.go.jp/content/000112674.pdf; http://www.moj.go.jp/content/000112675.pdf. Yukawa, Y., Harada, M. et al. (2015). Myanmar ni okeru min-syoji kankeitou no hunsou kaiketuseido no jittai (Status paper on the civil and commercial dispute resolution system in Myanmar). Ministry of Justice. http://www.moj.go.jp/content/001179166.pdf.